A legion of pop culture devotees were packing up their graphic novels, nursing hangovers and folding away superhero costumes for another year on Saturday as San Diego Comic-Con began winding down. Here are the key takeaways from the 2018 edition of the four-day fan fest that attracts 130,000 attendees to the southern California coast every July. A British cultural institution that has spread to more than 60 countries, “Doctor Who” unveiled its new cast, including the first extended glimpse of Jodie Whittaker’s debut as the first female Time Lord. A 40-second trailer demonstrated that the 55-year-old show about a time-and-space traveling alien is going for something of a rebirth. Fans were treated to exciting new worlds, new companions for The Doctor and an updated version of her trusty weapon of choice, the sonic screwdriver. 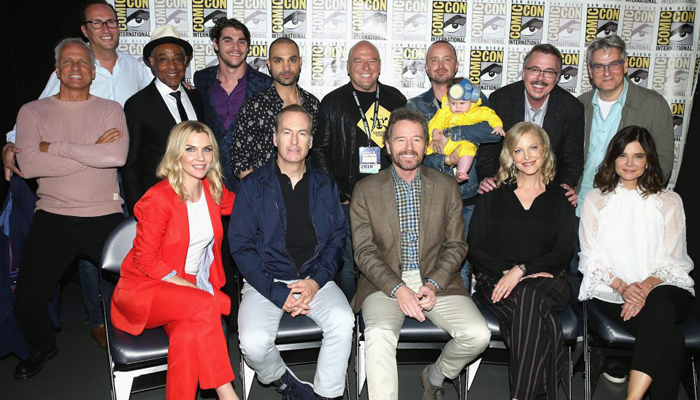 Yes, it really has been a decade since one of the best-reviewed shows in TV history changed the game, so the cast of “Breaking Bad” got together to reminisce about a show that really was as good as you remember. The series, which aired across the world from January 2008 through September 2013, told the story of Walter White (Bryan Cranston), a high school science teacher who responds to a terminal cancer diagnosis by turning into a powerful druglord. Cranston, a quick script-absorber, revealed he frequently used to trick co-star Aaron Paul into believing his character was about to die, while showrunner Vince Gilligan left the door open for a “Breaking Bad” movie. TV Land’s biggest open secret was officially confirmed when Andrew Lincoln, star of AMC’s mega-hit zombie apocalypse show “The Walking Dead” informed the Comic-Con faithful that nine seasons of getting harassed by the dead was enough. “I love this show. It means everything to me. I love the people who make this show. I promise not to cry. I’ve done enough crying on screen,” Lincoln promised. The star is said to be looking to break into movies, but will presumably be avoiding the genre popularised by the late (and presumably peacefully resting) “Night of the Living Dead” director George A Romero. In a reflection of the shift in the balance of power towards television, Hollywood´s “Big Six” movie studios didn’t cover themselves in glory this year — except for Warner Bros.
Disney, which owns Comic-Con fan favorite Marvel Studios, didn’t show up at all, even though this is an off-year for its own biennial “D23” convention. Between them, Fox, Universal, Paramount and Sony staged presentations for just six live-action movies in the convention´s iconic Hall H arena — three sequels, two spin-offs and a movie that has already had its theatrical run. Most of these films will generate excitement and a fortune at the box office but they hardly say ‘innovation’. Warner Bros, on the other hand, pulled out all the stops for “Scare Diego,” winning plaudits from critics for its upcoming slate of horror from its New Line Cinema division, and brought the house down at a two-hour presentation of many of its upcoming mainstream releases. A four-day pass to Comic-Con ranks second among the most coveted live entertainment event ($1,165) behind the Superbowl (starting at $3,667), according to online ticket marketplace Vivid Seats. There were more than 820,000 tweets about Comic-Con in the week leading up to the event. “Deadpool” got the most movie mentions, ahead of “Thor,” “Aquaman,” “Avengers” and “Star Wars”. The most tweeted-about TV show was NBC canceled “Timeless”, which wasn´t even at Comic-Con, followed by “Supernatural,” “The Walking Dead,” “Doctor Who” and finally “Riverdale”.